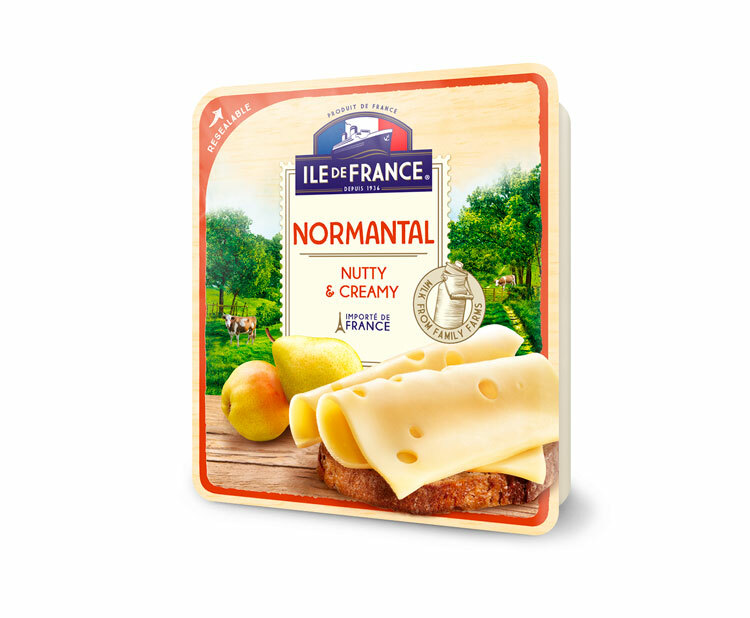 The Ile de France Normantal is a hold sliced cheese with a creamy and tender texture. It reveals a unique fruity flavor and will delight all taste buds. To achieve this result, our master cheesemakers obtain a very delicate curd that they drain just a little. This way the Normantal texture stays soft and develops a strong fruity personality during the ripening process. Sweet fruity flavor and soft texture. Pasteurised cow’s milk, culture, salt, microbial rennet. May contain traces of ewe and goat’s milk, haselnuts, cashewnuts and egg white extract. Packed in a protective atmosphere.